The heart of downtown Uzhgorod, Ukraine, is a large, open square with buildings on three sides and the Uzh River on the fourth. On warm days, vendors bring small horses and kiddie cars to the cobblestone square, and for a small fee, youngsters ride or drive them under the watchful eyes of their parents and the wary eyes of pedestrians. From that bustling square, people can cross the Uzh River on a pedestrian bridge. The other side of the river has a small commercial area with vegetable stands, the best hotel in the city, and several restaurants. This bridge is usually filled with people during the day and early evening. Walking on the bridge in April, I noted that it had an intriguing new feature that I had not seen in my earlier visits to the city: hundreds of locks had been attached to the bridge's railing along its sides. The locks came in all shapes and sizes. Most had writing on them in paint; some had words etched on them. Naturally, I asked a local resident why the locks were there. 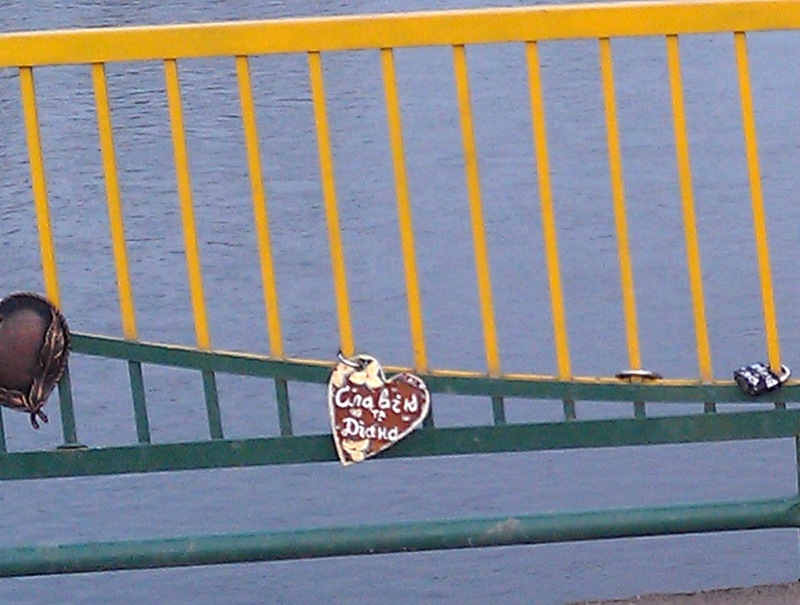 The explanation was that it had become a tradition in Uzhgorod that after a couple got married, they brought a lock to the bridge, fastened it to the railing, and threw the key into the river. This action signified that the couple was bound together in love forever. I don't know for sure if this story is true, but it is a touching (and optimist) one, so let's assume it is, accepting that the bridge over the Uzh River is adorned with the love locks of the recently married that bound them together for eternity. The keys to the love locks are deep in the river, never to be retrieved. (I can't help but imagine the puzzlement of the fish underneath the bridge who have witnessed a blizzard of keys plunking into the water). 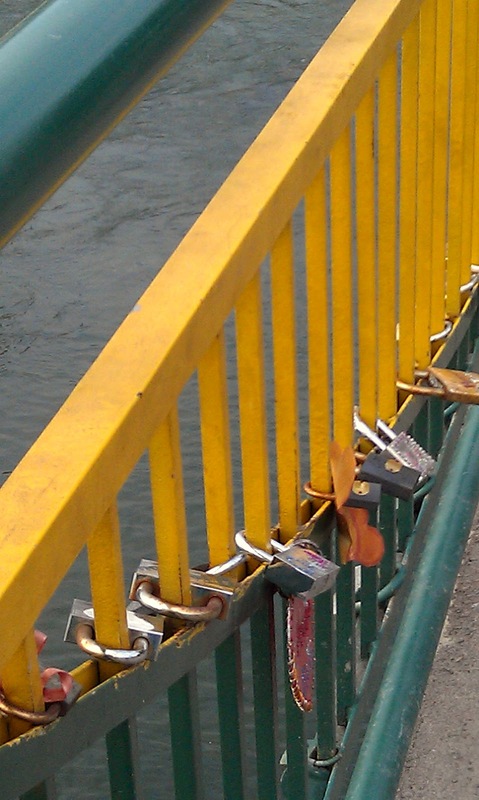 I left Uzhgorod feeling good about its bridge and its love locks. I guess I thought that maybe they are a unique feature of the city. However, I soon found out I was wrong. About a week after seeing the locks on the Uzh River bridge, I was in Salzburg crossing its pedestrian bridge. What did I see? 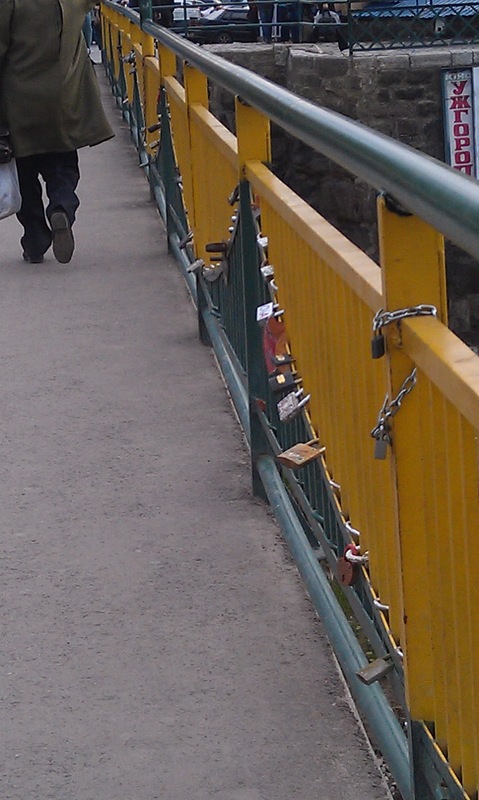 Love locks attached to its railing! 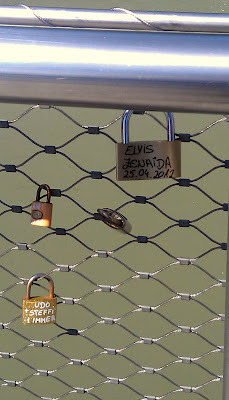 The Salzburg bridge has smaller and less distinctive love locks than the ones on the Uzh River Bridge, but it certainly has them. 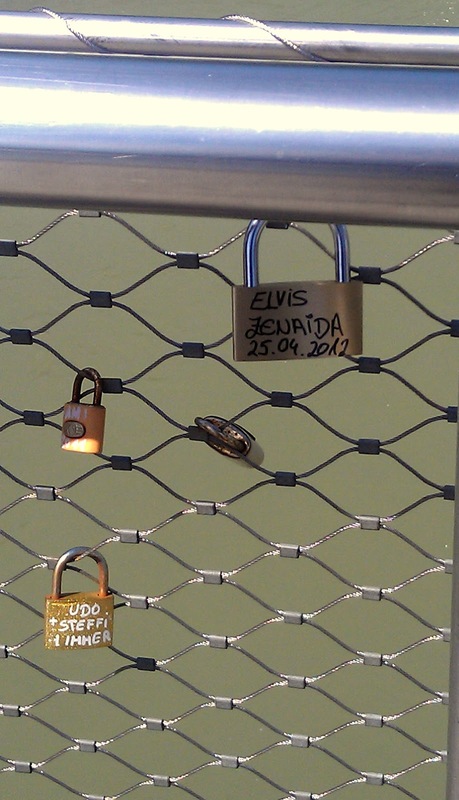 Seeing the love locks in both Uzhgorod and in Salzburg raised some questions that I cannot yet answer. 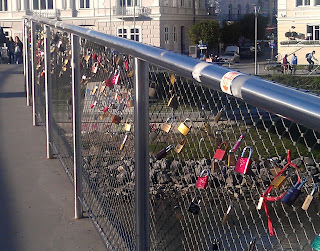 Do all pedestrian bridges in European cities have such locks? Which city started this tradition and when? 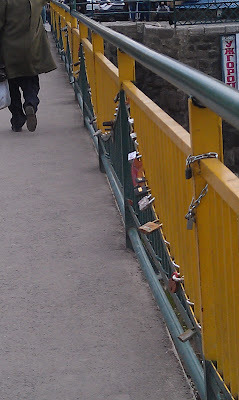 Do the locks signify different things on different bridges? These and other unanswered questions could easily change the nature of the locks on the Uzh River bridge from a heartwarming story about a symbol of eternal love to a social science research project, from romance to empirical inquiry, from poetry to prose. So, I will choose to ignore these questions and instead simply continue to recall the locks attached to the bridges over the Uzh and Salznach Rivers as interesting and optimist expressions of love.